Purpose: Use this document to inactivate a combo code in ctcLink. Select the Find an Existing Value tab. Enter Set ID and GL Combination to be inactivated. Identify the resulting information as being the Combination Code to be deleted. Select the Correct History button (at bottom of page). Note: The default effective date will be 01/01/1901 – if the combo code shouldn’t have been created and hasn’t been used, leave the date as 01/01/1901 when inactivating the combo code. If the combo code has been used for past transactions and is no longer active, enter the effective date when it will no longer be used. Change pull down Status to "Inactive". The combo code is now inactive but can be reviewed by running either a query or a PAY760 report. 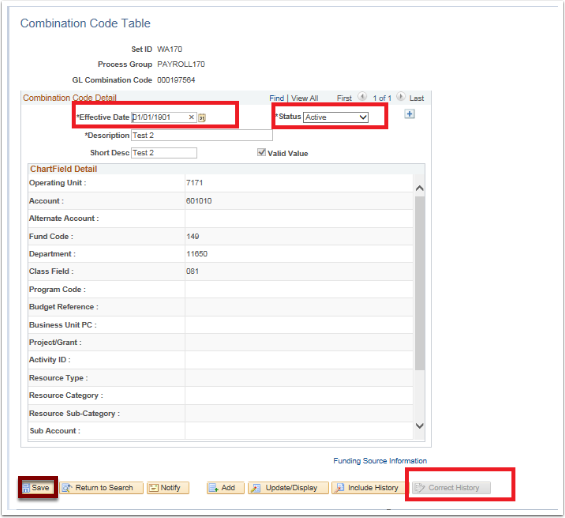 Create a new Run Control ID by clicking on the Add a New Value tab and entering in a description name for the Run Control, OR access an already created Run Control by clicking on the Find an Existing Value tab. 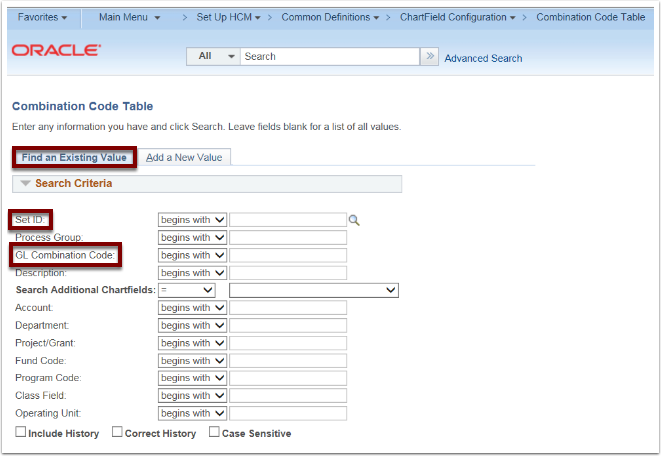 Select the Search button (for existing Run Control ID) or Add (for new Run Control ID). The Combination Code Report should be check marked. The run number should appear below the Process Monitor title. Select the Process Monitor link to review the progress of the Run Control. 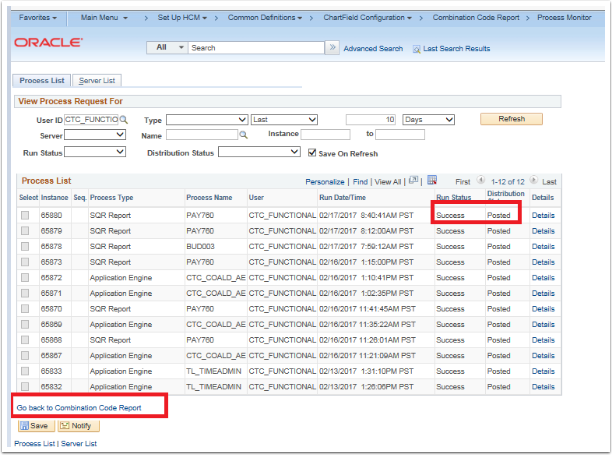 Once is says "Success" in the Run Status column and "Posted" in the Distribution Status, the PAY760 report can be reviewed. Select the Go back to Combination Code Report link. Select the Report Manager link. Select the Report Description link. The report is a PDF file which can be searched for the combo code. Press Ctrl+F to find the old combo code to be inactivated (The combo code is the third field on the first line of an entry). When using Ctrl+F, enter the Combo Code number. Additional Information: At the beginning of a new year, in which there are large volumes of entries, ERP Support can execute a mass upload rather than college staff entering each line. The same is true for mass inactivations for expired combo codes.